Two kids (Hays Wellford and James Freedson-Jackson) stumble across a cop car and take it for a joyride, pursued by a coked-up corrupt cop (Kevin Bacon, obviously). The insane premise triggers ingenious subversion of action movie beats, to which the kids respond not like cops but like kids, in a similar way to Mystery Team or Hunt for the Wilderpeople. And like Wilderpeople, the director (Jon Watts) has been snatched up by Marvel to make Spider-Man: Homecoming, because an indie hit fast-tracks you directly to the MCU. Do not pass Go. Do collect $4 million. That’s not a bad legacy for a low-budget B-movie that never even got a UK release, despite its superiority to virtually all of last year’s blockbusters. Like a cop car driven by two children, the film veers wildly between comedy and intensity, as Watts cranks up the tension with every implausible twist and turn. The high concept invokes the stripped-down, white-knuckle thrills of Duel or Premium Rush, with added elements of Edgar Wright and Stephen King. Interesting, fun and quite mad, the film only features three adults, and they’re all as crazy as the movie. Living up to his porcine name, Bacon is on relishingly seedy form as the cop in a vest, like John McClane with a pornstache. Freedson-Jackson and Wellford also impress as the two children, helplessly plunged into a bloody game of cat-and-mouse, unfolding like Stand By Me meets The Hitcher. 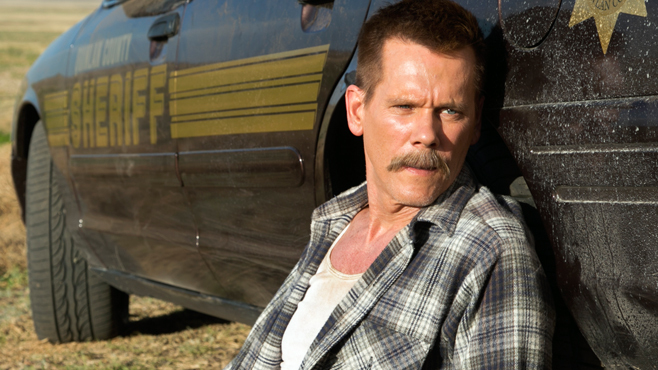 Just shy of 90 minutes, Cop Car is one lean, mean and massively entertaining joyride.